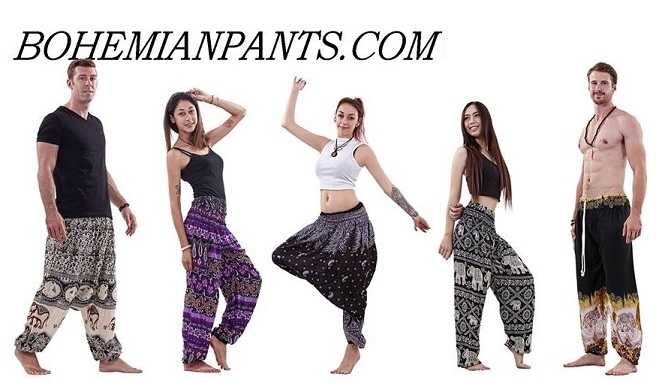 At Bohemianpants.com, you will find the best selection of Bohemian Harem pants, yoga pants and boho pants. The pants we are offering are not the typical kind of pants you will find at a standard shop. They are the most comfortable pants you will ever wear! Perfect for yoga, exercising, traveling or relaxing at home or on the beach. The pants are designed to be comfortable, but with their bohemian aura, they are also very stylish and unique. We are located in the northern part of Thailand, surrounded by mountains and rain forests in the beautiful city of Chiang Mai. Our environment consists of yoga, traveling, meditation and beautiful nature which reflects in the style, design and colors of our pants. With our expertise combined with our customers ideas, we have created the best selection of Bohemian Harem pants and have made them available worldwide. We do all in our power to make our customers feel safe and satisfied shopping with us by offering money back satisfaction guarantee. One size fits most = no size issues!